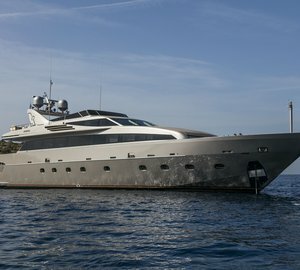 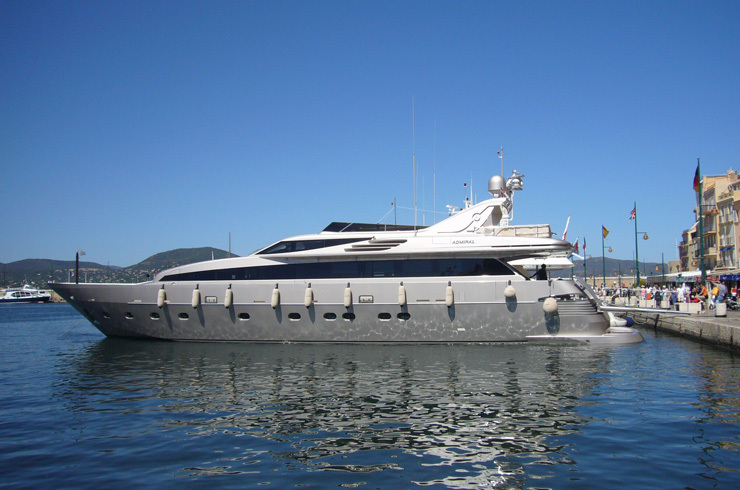 Built in 2007, motor yacht LUMAR is a 33,8m (110,11ft) Cantieri Navali Lavagna- Admiral design. 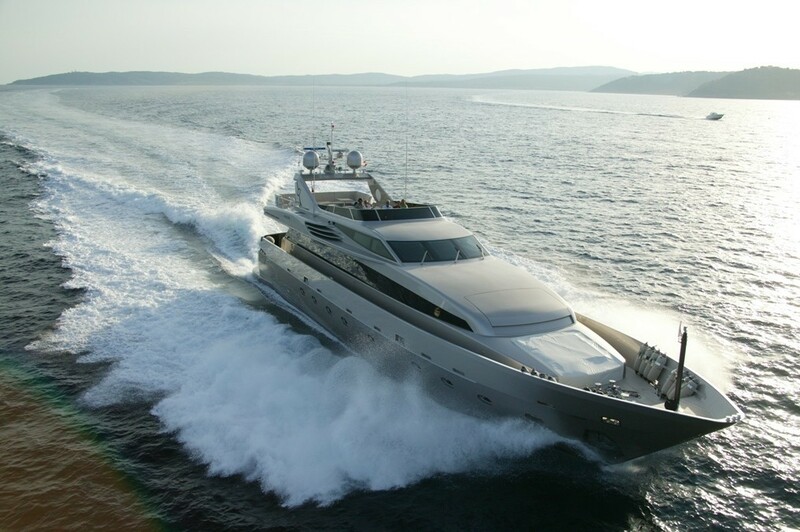 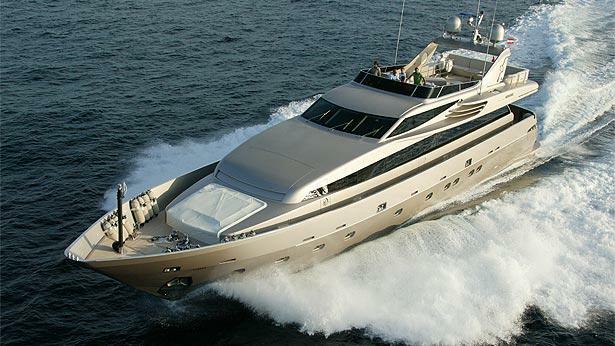 She offers luxury charters for up to 8 guests, in 4 spacious cabins. 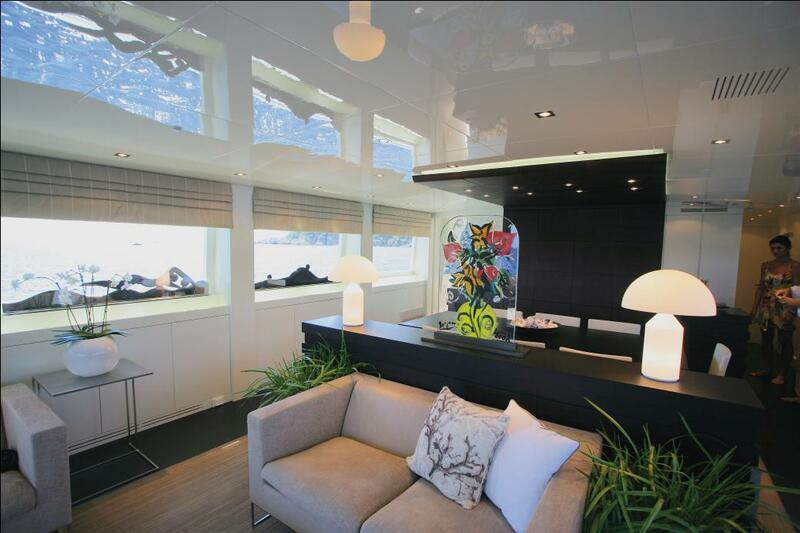 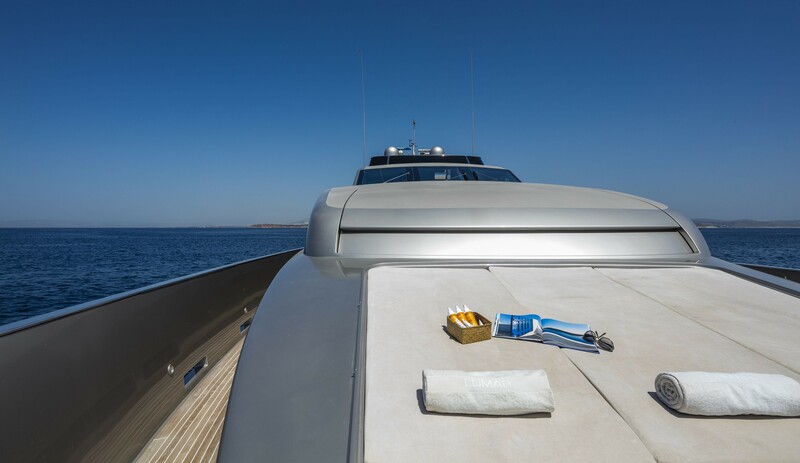 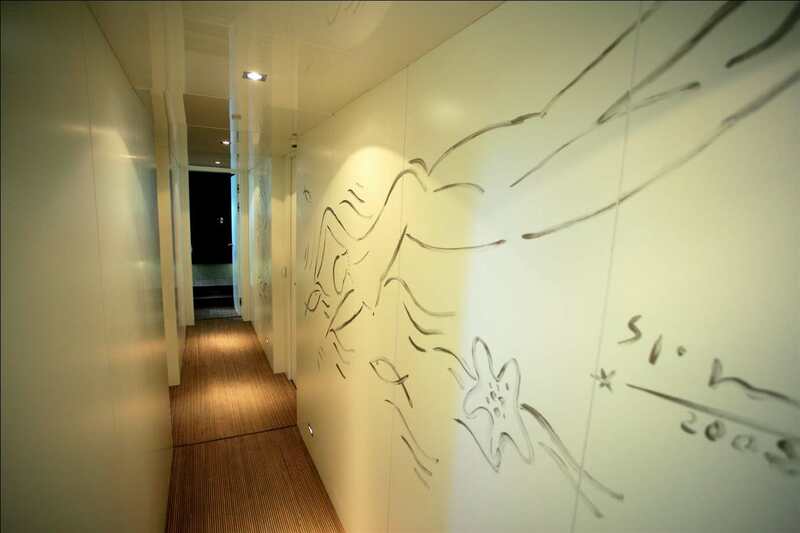 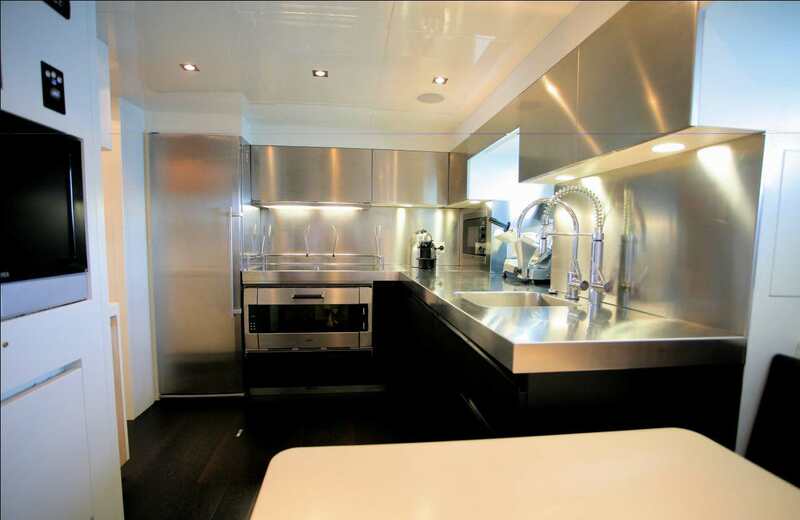 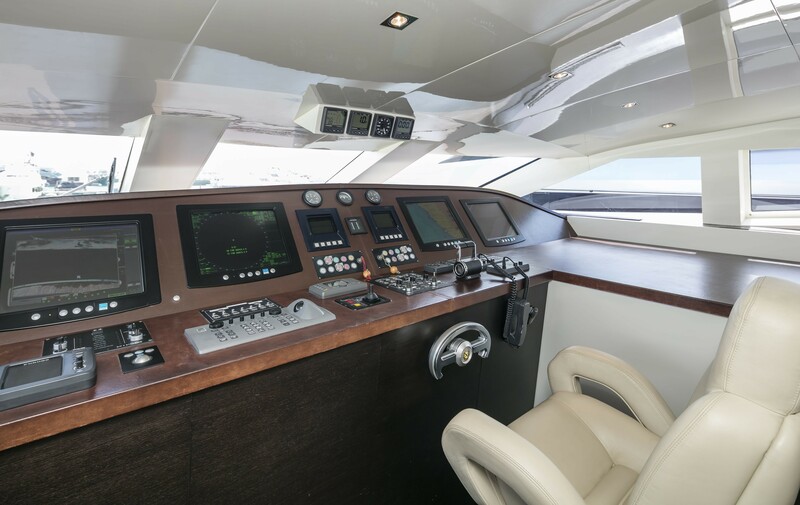 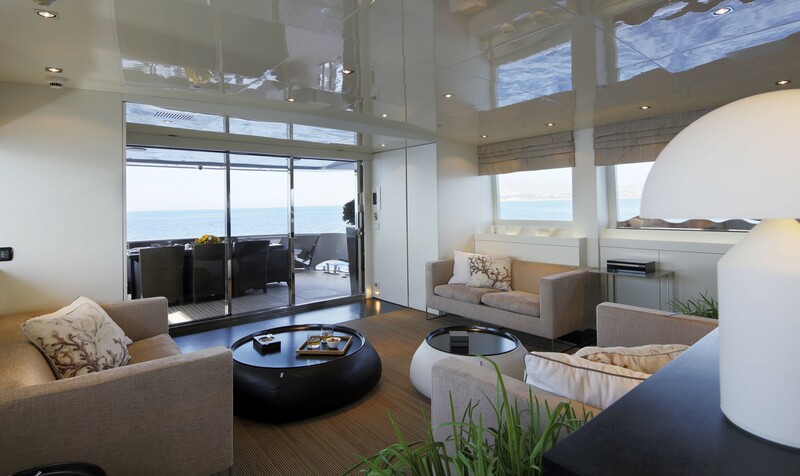 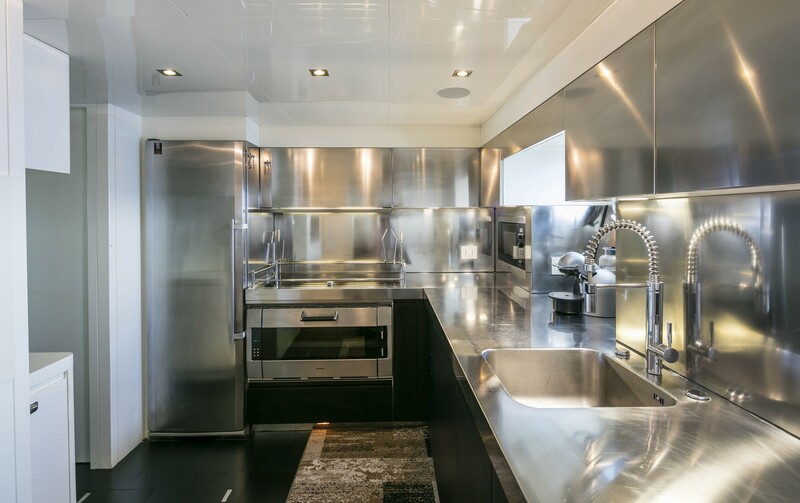 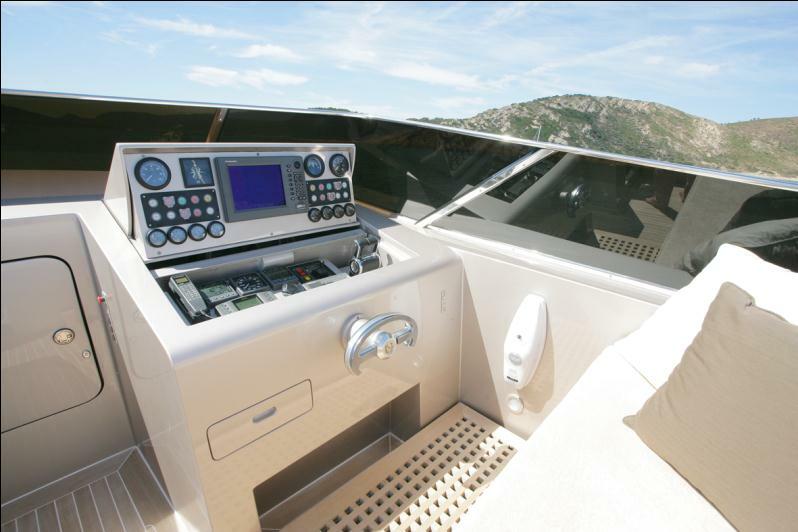 The yachts interior décor is contemporary and minimalistic. 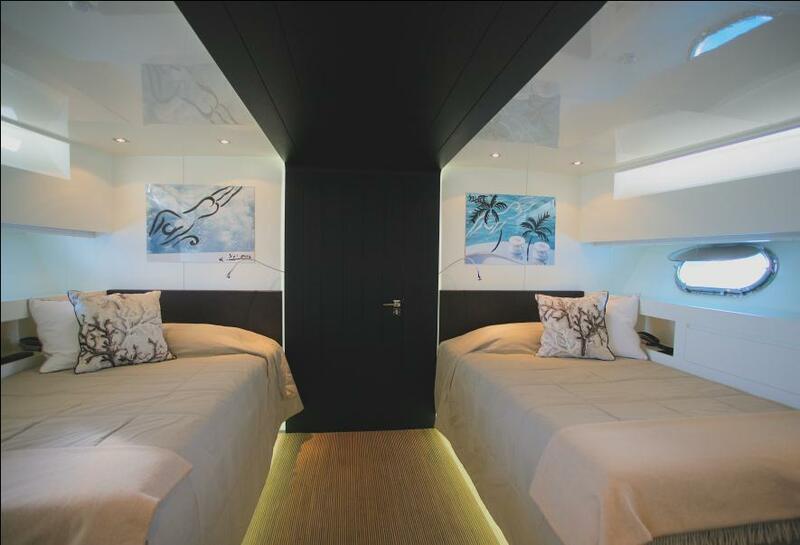 White paneling with dark wood accents, create a refined and tailored ambiance, while cool grey soft furnishings and earthy tones, boast sophistication and style. 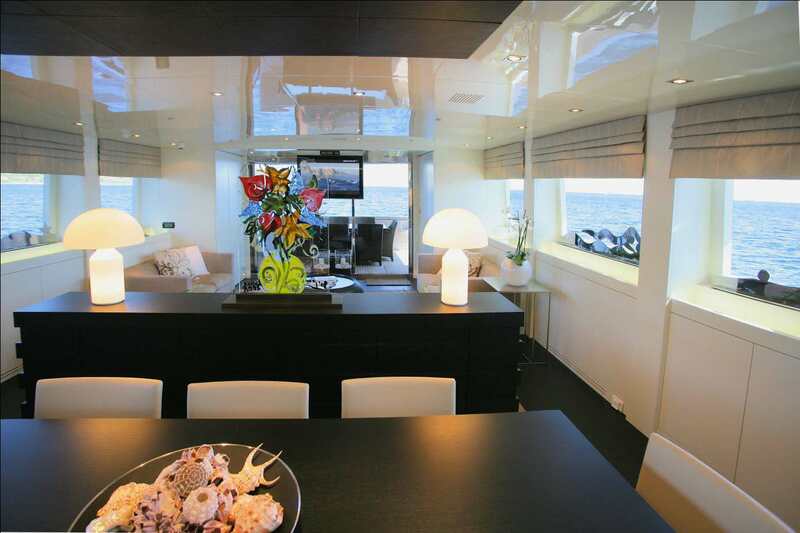 The salon and formal dining is on the main deck in an open plan, with the lounge aft offering 2 opposing sofas, ottomans and entertainment systems. 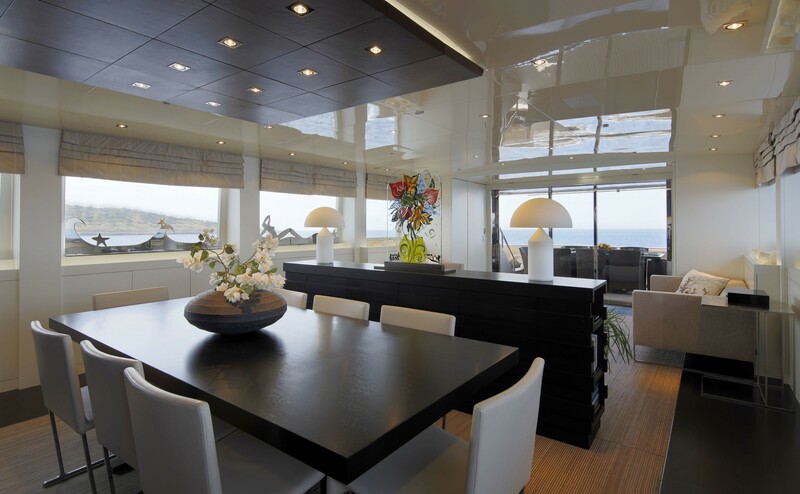 An island credenza gives a casual separation to the elegant formal dining table forward. 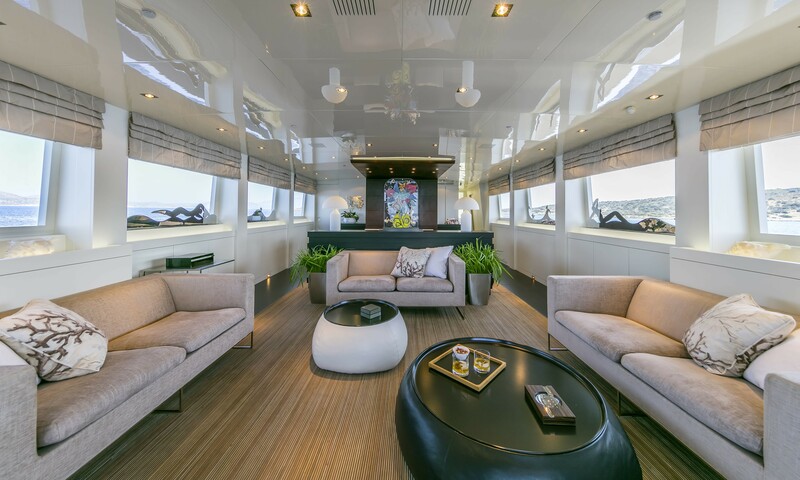 Surrounded by elongated side windows and featuring large aft sliding glass doors, the salon receives ample natural light. 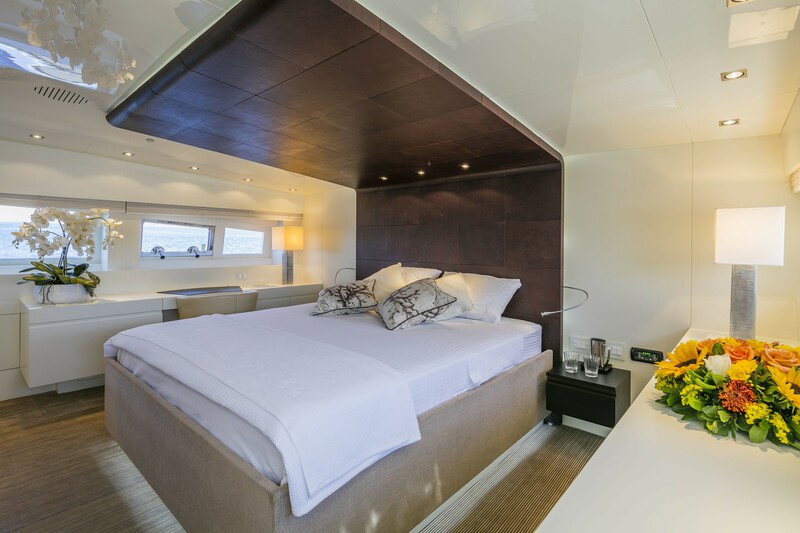 Accommodation is in 4 guest cabins, with the full beam deluxe master suite on the main deck forward, and 3 generous guest cabins on the lower deck. 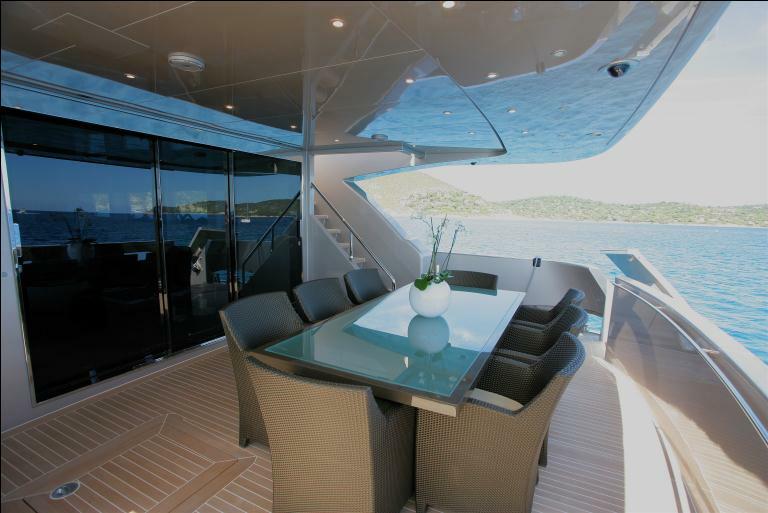 Deck space is well-appointed on 2 levels, ideal for relaxation and socializing. 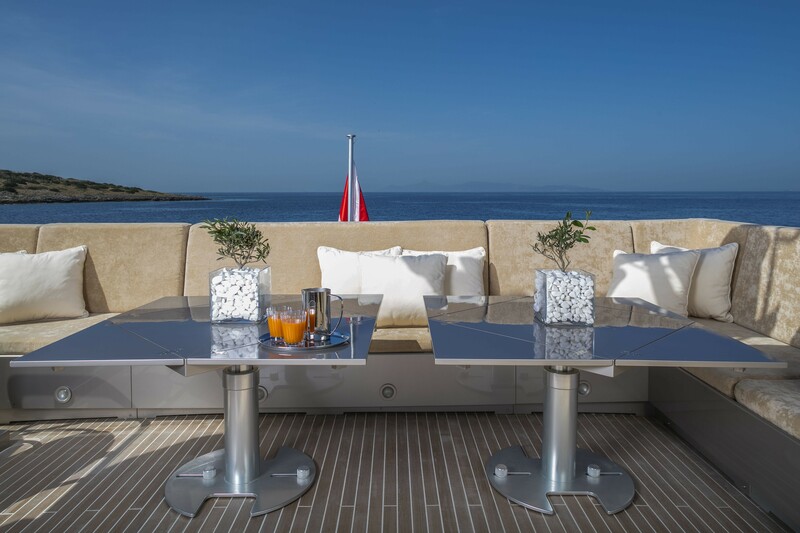 Stepping out from the salon sliding doors, guests are welcomed to a shaded aft deck, complete with a large glass topped alfresco dining table and comfortable seating. 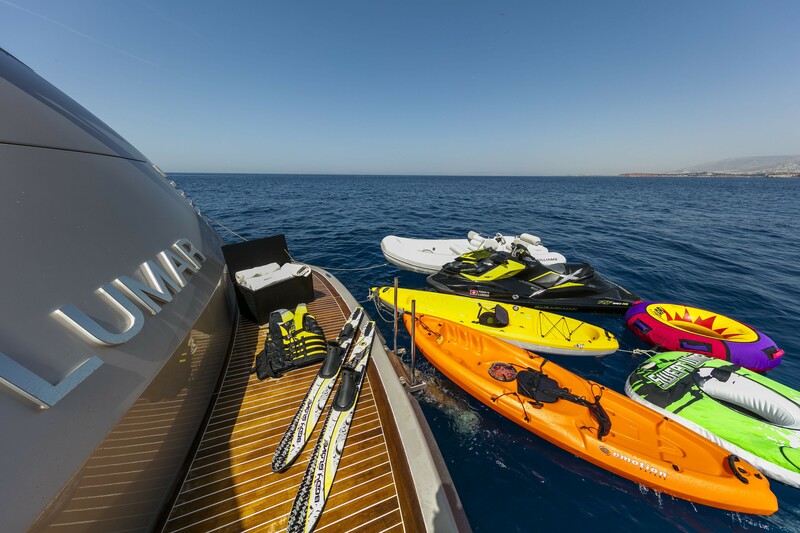 If water toys are on the priority list, the extended swim platform will be sure to welcome the active in the group. 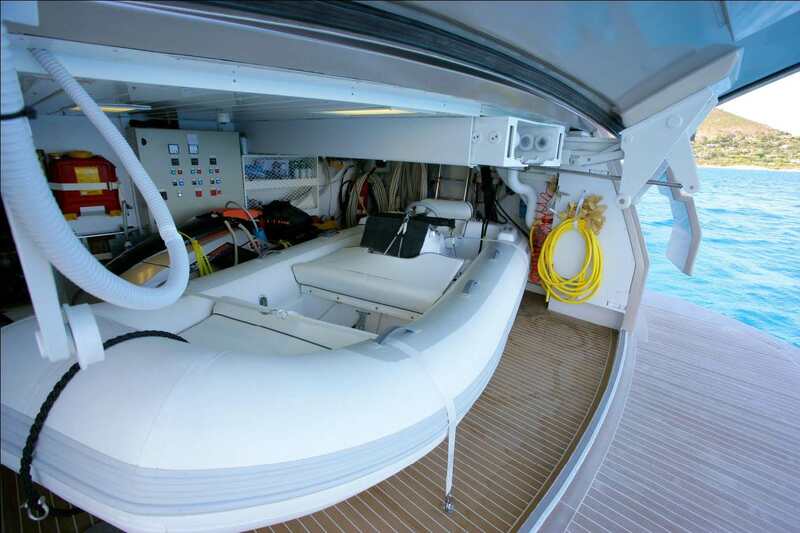 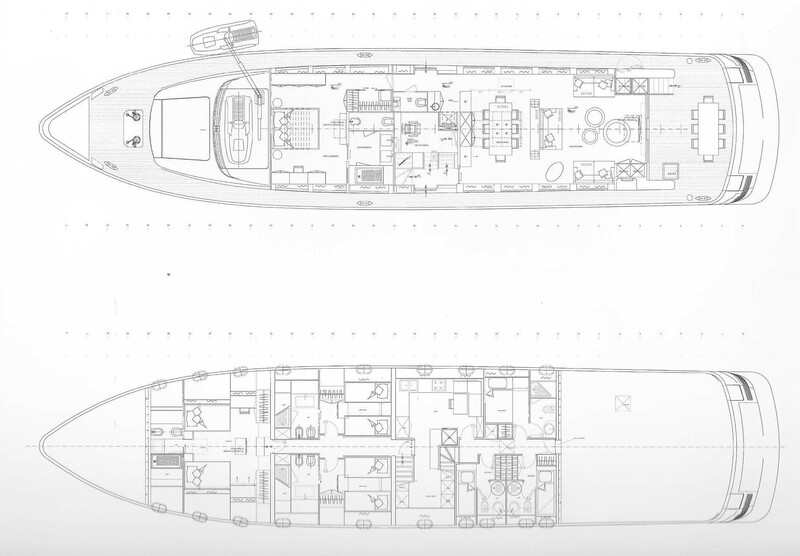 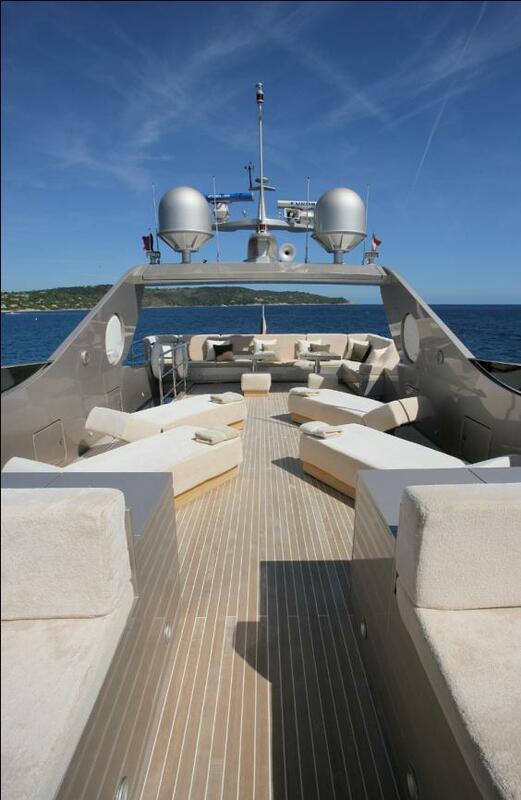 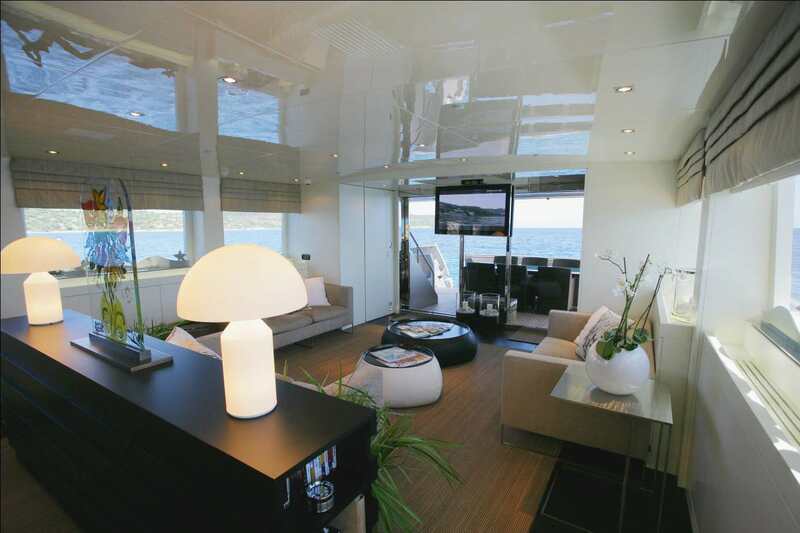 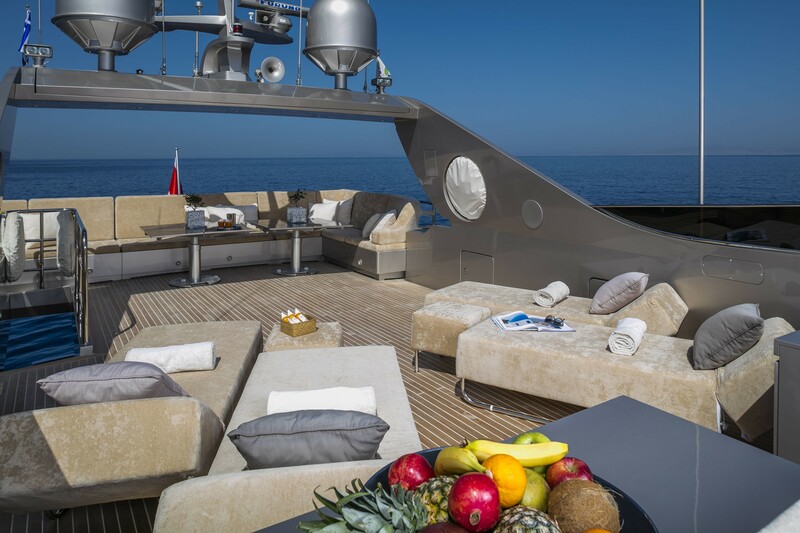 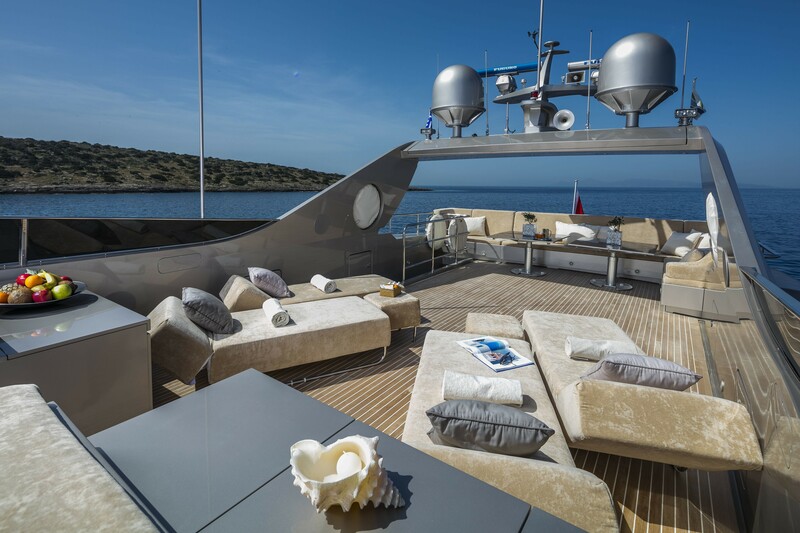 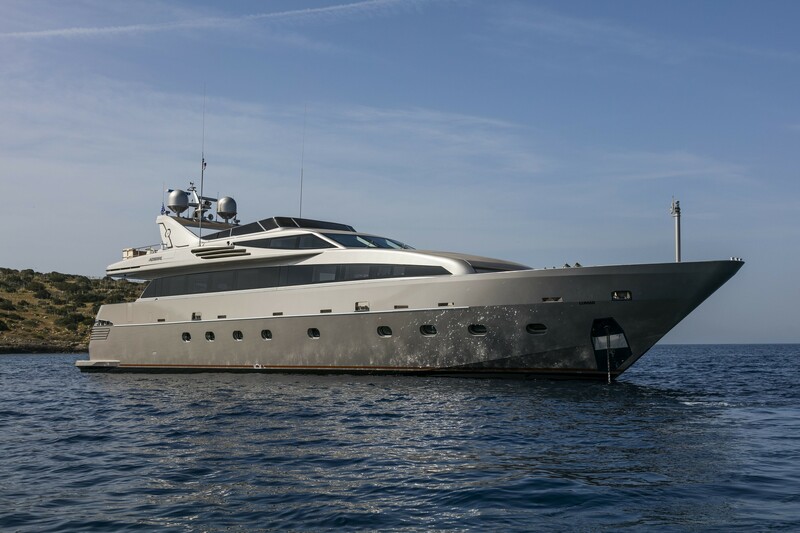 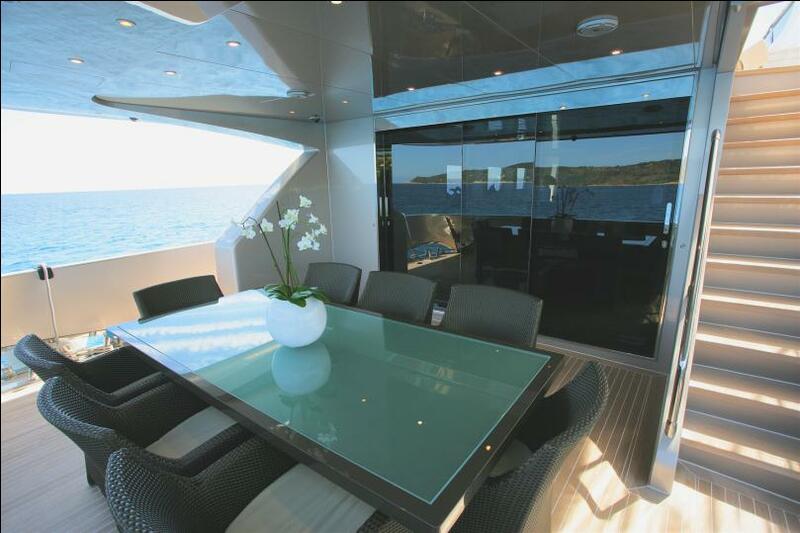 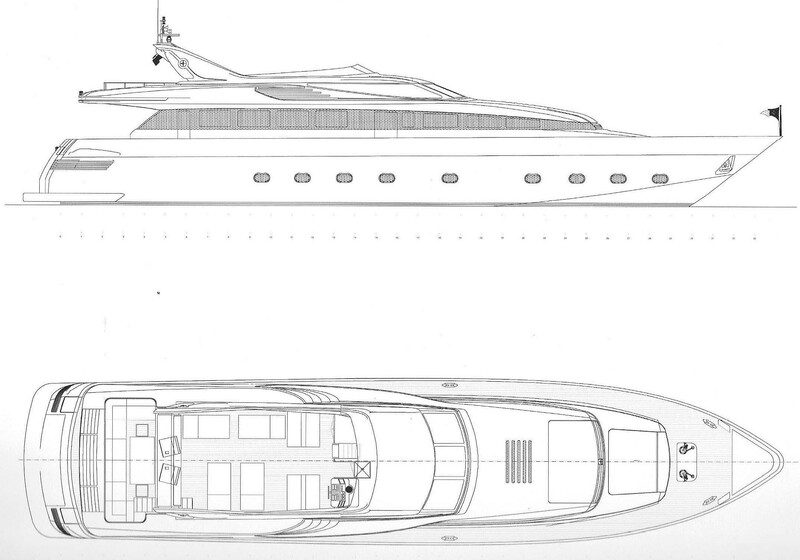 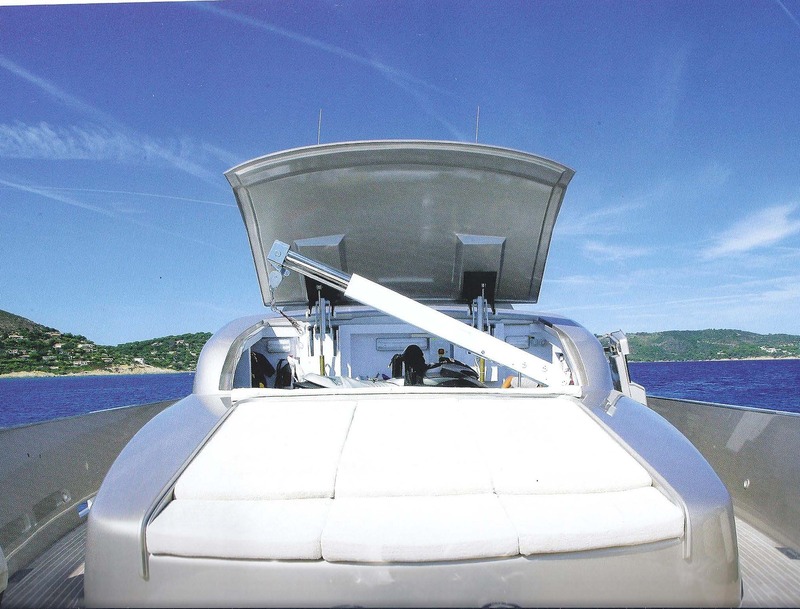 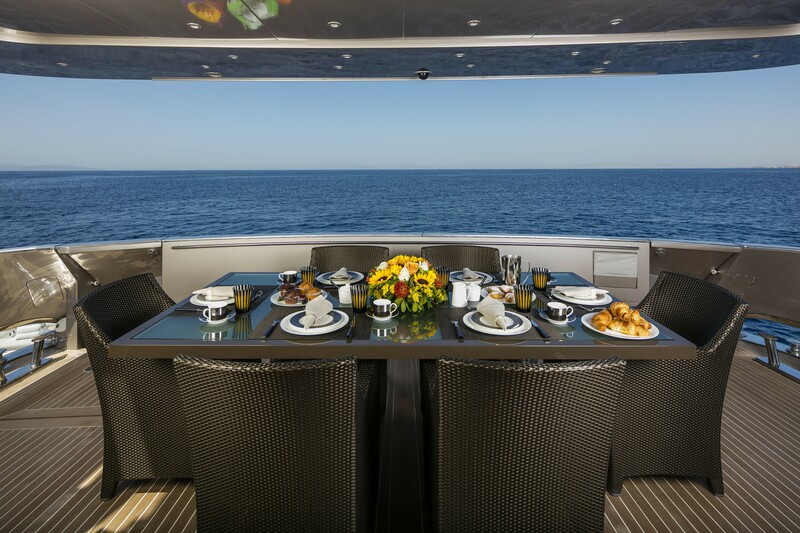 The main deck wraps around the yacht and leads forward to a large inviting sunpad. 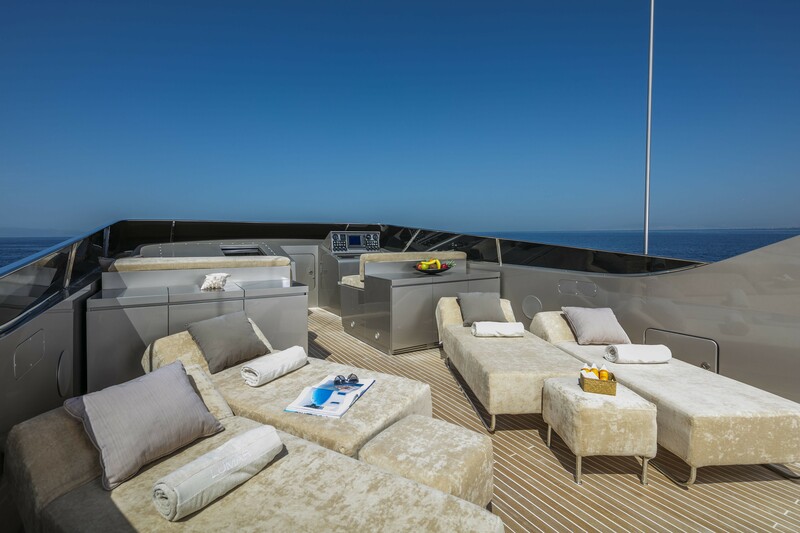 On the sundeck, there are plush sunpads, chaise loungers and a full beam seating area, with cocktail tables. 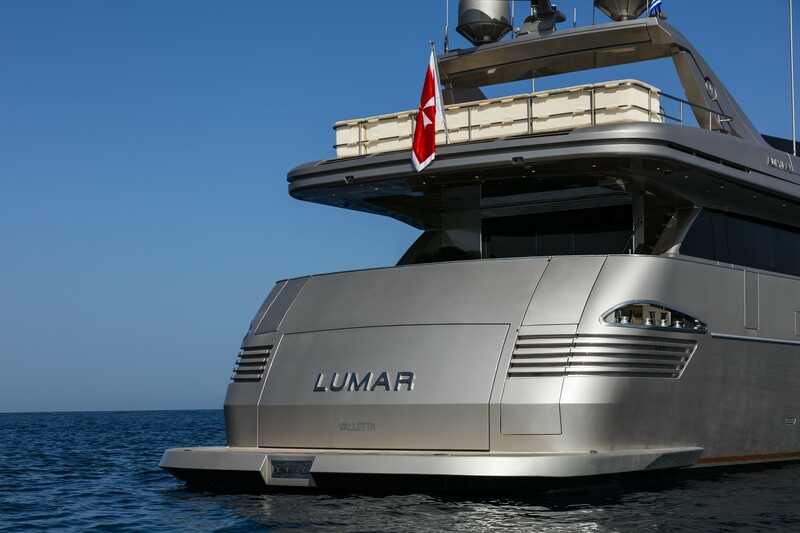 Constructed from aluminum, M/Y LUMAR is powered by 2 x MTU 13V 2000 M93m 2,400hp engines, she cruises at 26 knots and can reach impressive top speeds of 30 knots. 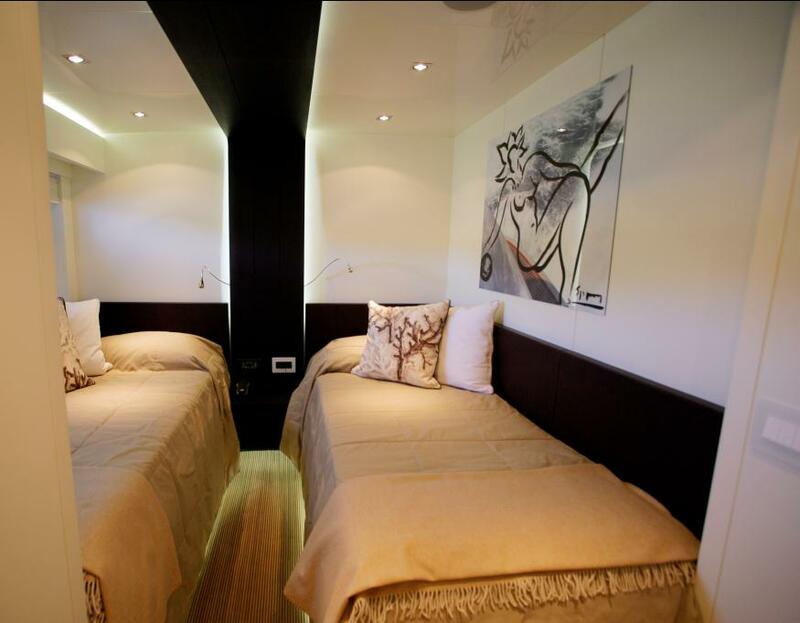 Accommodation is in 4 timeless cabins for up to 8 guests. 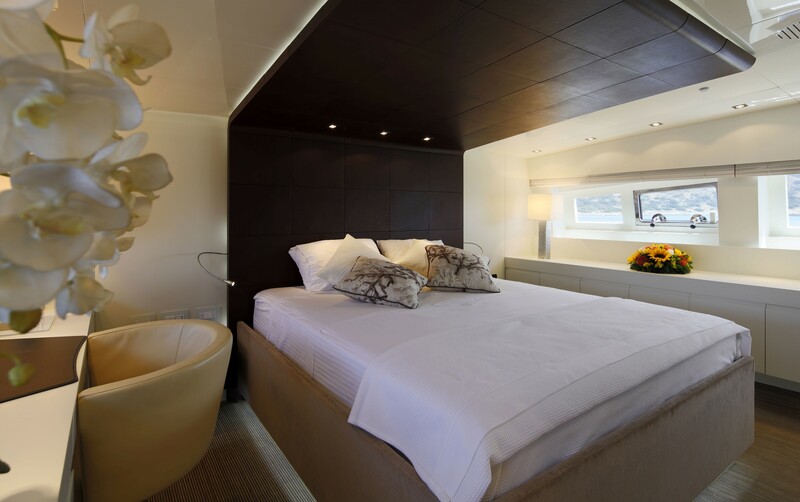 On the main deck, forward of the salon is the sumptuous master suite, with a center lined king size bed, vanity, large en-suite with his and hers sink, plus a deluxe walk in wardrobe. 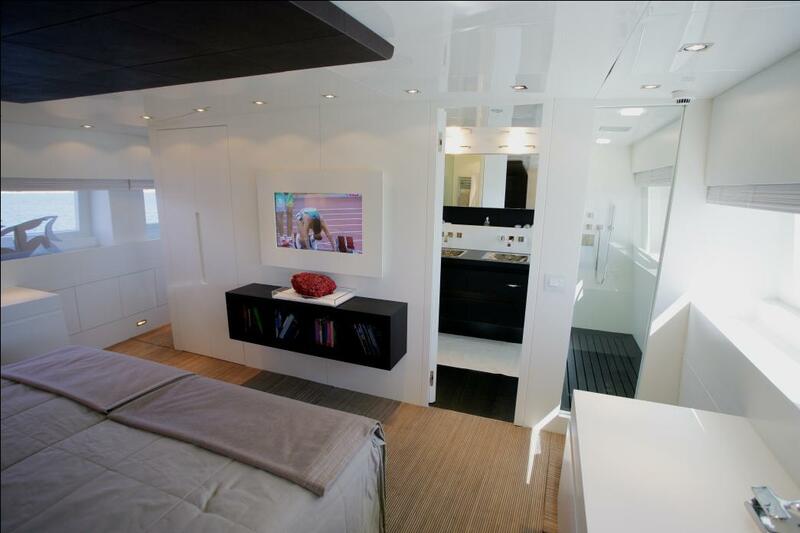 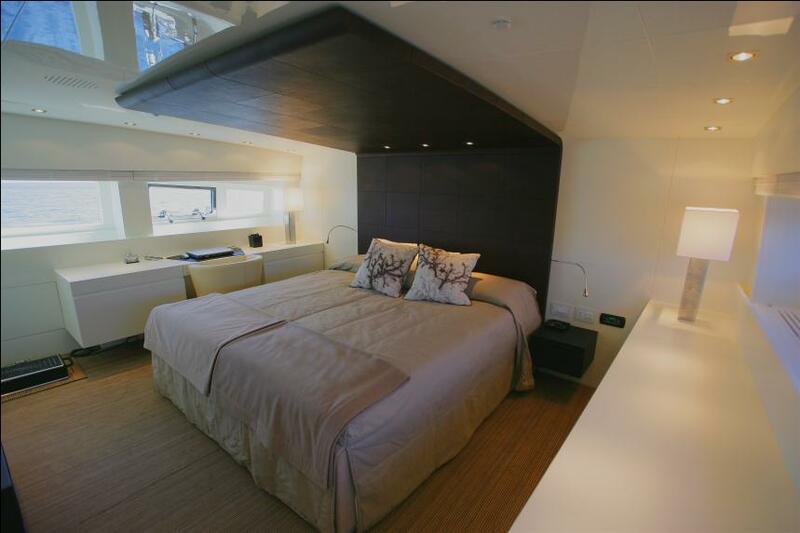 The lower deck is comprised of 1 VIP cabin with 2 double beds and 2 twin cabins, each with side by side single beds. 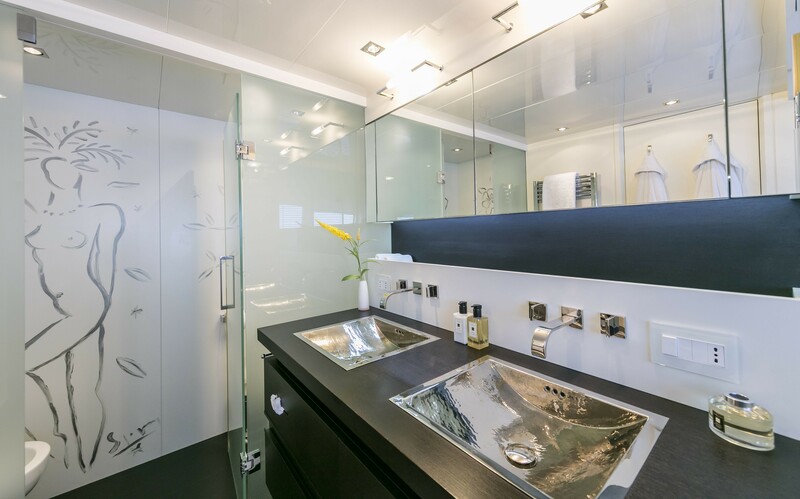 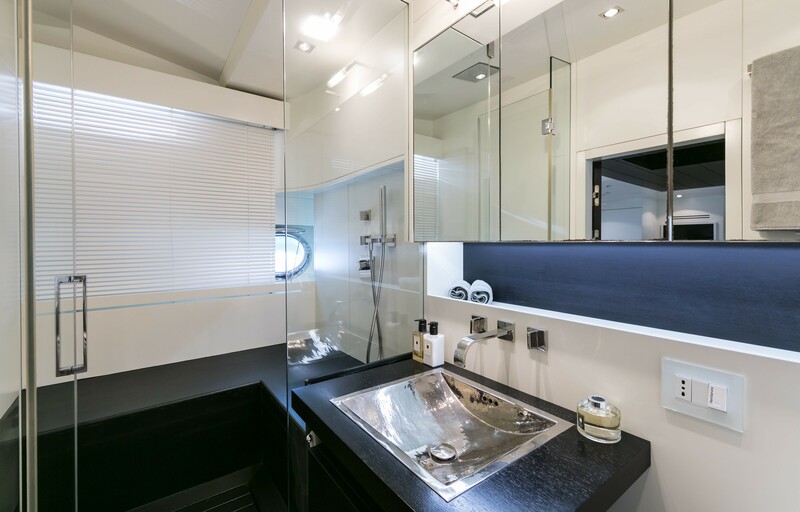 All cabins offer private en-suite facilities.